In your job quest, you may find it useful to become more knowledgeable on the nonprofit sector. The statistics provided on this page are designed to broaden your understanding of the sector but in no way offer a complete picture of the intricacies within the sector. 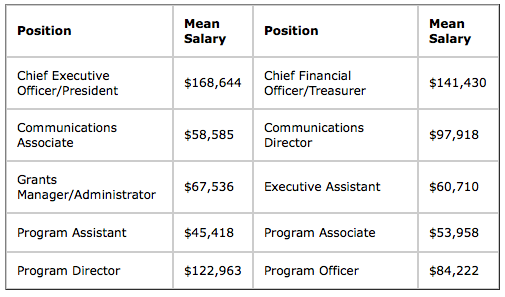 Below is a sampling of data that may help you to form a more well-rounded understanding of the makeup of foundation staff and the salary and benefits offerings available at various foundations. The current numbers don’t tell the whole story—the philanthropic sector is working hard to increase its diversity. Click here for more information on Philanthropy New York’s Special Committee to Increase Diversity in Philanthropy and D5, a national coalition to grow philanthropy’s diversity, equity, and inclusion. This is by no means an all-inclusive list of efforts to increase diversity in philanthropy, but it will offer you a more complete understanding of efforts within the sector to address this issue.